Eye catching signage will attract customers and is a great way to promote your products or services. Messages will come alive with full colour graphics that are unique and impactful. At Gateway Visual Communications we have been in the signage business for decades. Our experience and expertise can help you create signage that gets your message across. Customized wall graphics or full colour murals add life to underutilized walls. Multiple panels can be applied to create impressive artwork. Quick change wallpaper panels are possible with magnetic wallpaper. Graphic panels can be swapped out and are reusable. This is a great product for retail environments that require seasonal décor changes and it can be used for corporate applications. Full colour graphics can be applied directly to windows, giving you the opportunity to promote your business and services to the general public. Perforated films are a good choice when you require some privacy, but also want some sunlight in the room. 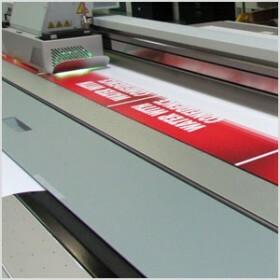 While solid films provide full privacy and complete coverage of the window. Traditional solutions like vinyl letter and frosted films are good options for windows that require a subtle treatment. This is an interesting option for dividing up a large area or to help define departments in an open office plan. Fabric panels have a light and airy feeling, and perforated vinyl panels can be used for internal or external areas where an unattractive feature can be disguised to the outside world. UV flatbed printing techniques make it possible to print on almost anything. You can add graphics or a message to architectural products such as doors, roll-up blinds, ceiling tiles, glass and even ceramic tiles can be enhanced. Why wait to start promoting your construction project. Post your marketing message on underutilized construction hoarding with full colour images and start selling your project before it opens.